Princella Smith is the Senior Contributing Editor for Breaking Israel News. She spent 13 months in Israel pursuing a Master’s in Counter-terrorism and Homeland Security at the IDC in Herzliya, Israel and as a writer, producer, and American Liaison for Israel Hayom Newspaper in Tel Aviv. Prior to this, she served as a communications operative on Capitol Hill in Washington, DC and for such political figures as former House Speaker Newt Gingrich. She is a native of Arkansas in the United States of America. 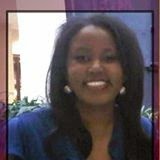 She is currently an Ambassador for Save A Child’s Heart headquartered in Holon, Israel and resides in Arkansas where she hosts “Engage the Nation” on KARN News Radio, 102.9FM in Little Rock. This year, there will be two total lunar eclipses known in laymen’s terms as “blood moons”. The first will occur on the first full day of Passover Tuesday, April 15, 2014 at 9:46AM Israeli Time. The second will occur on Wednesday, October 8, 2014 at 12:25PM Israeli time. Sukkot also known as the Feast of Tabernacles will begin at sundown on October 8th. 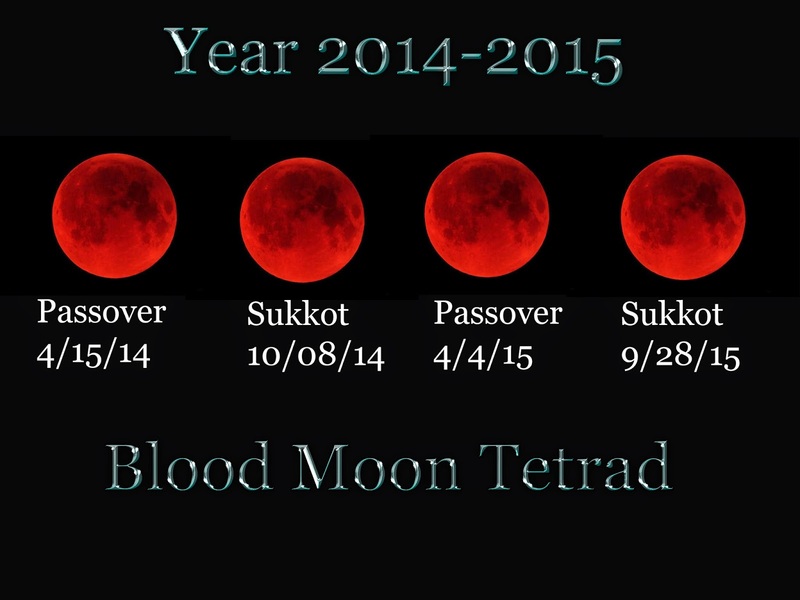 In 2015, next year, two more blood moons will follow the same pattern, occurring on the first days of those two major Jewish holidays. When a set of four scientific occurrences unusually happens so closely together, it is called a tetrad. Thus, the phrase “blood moon tetrad” has been coined over the past seven years in writings of several scientific and religious thinkers. The reason for this can be traced to the Jewish Talmud, an important Jewish text used to define religious Jewish law and Moses’ five books known as the Torah. Tractate Sukkah 29a indicates that if the moon is in eclipse, it is a sign of wrath that will come upon Israel while solar eclipse of the sun is a bad omen for the world. In the case of a blood moon eclipse, the Talmud adds that: “If its face is as red as blood, (it is a sign that) the sword is coming to the world.” In summary, Lunar Eclipse = bad omen for the Jewish people and Israel; Blood Moon = sword coming; Solar Eclipse = bad omen for the world. It can also be traced to the findings of Mark Biltz. Seven years ago, Biltz first revealed the correlation between the dates of past and pending blood moons with feast days and historical world events. Biltz continues to have one of the highest selling books on Amazon. His Blood Moons: Decoding the Imminent Heavenly Signs released this past March has piqued the interest of the intellectual, scientific, and religious worlds. Prominent Christian ministers—notably John Hagee, the founder of Christians United for Israel (CUFI)—have cited Biltz’s work over the seven-year span to explain the Blood Moon Prophecy in their various publications about Israel’s future. Biltz, a Christian who was raised to celebrate both his Jewish and Catholic roots, spoke exclusively with me several months ago for Breaking Israel News about the wonders of the galaxy that will happen next week as the Jewish people begin their Passover celebration. Biltz has a point. If Christians examine the Hebraic roots of their faith more closely, they will understand that the Hebrew terms “moadim” and “owth” are used to describe appointed times, seasons, signs, and omens—not necessarily the temperature and precipitation. When Biltz visited the NASA website in 2007 and saw the dates of the blood moon tetrad scheduled for 2014 and 2015, he immediately noticed that each was scheduled to coincide with major Jewish feasts because of the knowledge of his Jewish background. He continued about the blood moons: “2 Partial Lunar Eclipses occurred on the Jewish Passover and Feast of Tabernacles holidays in 70 A.D. when the destruction of the 2nd Temple happened on the 9th of Av according to the Hebrew calendar or August 4th in 70 AD. In 73 A.D., the Roman Army conquered Israel ending over 1,000 years of Jewish rule in the Holy Land. Biltz’s historical analysis checks out to be accurate, and he begins to spread the word. Soon, Christian theologians worldwide begin watching the skies, repeating Biltz’s findings and forewarning the nations that something significant is bound to happen in the Holy Land. Rema Ministries completed series of white papers on the blood moons and point out also that in 1493 and 1494, a blood moon tetrad occurred during Passover and the Feast of Trumpets Jewish holidays just months after King Ferdinand and Queen Isabella ordered all Jewish people to leave in mass exodus. This is known as the Spanish Inquisition where 200,000 Jews were expelled from Spain. Tens of thousands of them died while trying to reach safety. Horrible crimes were committed against them including knifing deaths by brigands who believed a terrible rumor that they had swallowed gold and diamonds, so they literally searched for treasures in the stomachs of the expelled Jews. America is now home to over 5 million Jews and served as an escape haven for many who sought to escape persecution during the Holocaust. Jewish tradition has mixed views on the mystical and eschatological meaning of lunar eclipses. On the one hand, the Talmud (Tractate Sukkah 29a) says that lunar eclipses are a sign of Divine wrath against the Jewish people for moral failings, while solar eclipses are a bad sign for non-Jewish nations; the Jews date their calendar based on the phases of the moon, while the non-Jews base theirs on the solar year. On the other hand, Jewish tradition repeatedly says that astrological and astronomical signs do not affect the Jewish people, and that the Jews' direct relationship with G-d overcomes any “natural” effects of the movement of heavenly bodies that could affect other nations. While Elijah sought for a sign from God, he looked for it in the "wind," "earthquake" and "fire." Instead it came in an unanticipated "small, still voice." It may be that in this instance God is sending a message from the plainspoken tongue of a Christian man with Jewish roots whose family had changed their name from Hirsch to Biltz to escape persecution of being a Jew. Thanks so much Krissy...a Blessed Holy Week and Blessed Easter to you and your family!